Arizona, known as the Grand Canyon or Copper State, is synonymous with unforgettable desert landscapes and a mild winter climate that makes for golfing heaven. Discover the 10 best Valley of the Sun golf resorts and clubs. Then make your plans for a golf getaway on courses created by some of the nation's best golf designers. The legendary Wigwam Golf Resort & Spa in Litchfield Park, Arizona, has been a retreat in the Valley of the Sun since 1929. Located just 20 minutes west of downtown Phoenix, the resort boasts 331 casita-style rooms, three championship golf courses, several restaurants featuring fine regional cuisine, nine lighted tennis courts, two pools, lush gardens, and a multitude of recreational activities. Wigwam's three 18-hole championship golf courses offer unmatched diversity for an Arizona resort. Enhancements to the courses designed by Robert Trent Jones Sr. include an island green, expanded practice facilities, and the acclaimed Jim McLean Golf School. The Wigwam has also recently completed major improvements to the resort, including a new Elizabeth Arden Red Door Spa, an uncluttered getaway where guests can lounge in plush surroundings made specifically for meditative relaxation. The two-story spa facility will encompass 26,000 square feet of indoor and outdoor areas that mirror The Wigwam's adobe-style architecture. The closest airport is Phoenix Sky Harbor International Airport. The airport is served by Delta, American Airlines, US Air, United, Northwest, and several other airlines. Westin Kierland Resort & Spa is located next door to Kierland Golf Club with more courses around the corner. The hotel is also adjacent to Kierland Commons, a development featuring upscale specialty retail, entertainment, and dining venues, plus a night spot. Westin Kierland Resort & Spa also has several restaurants and lounges on the property including the Brittlebush Bar & Grill. Westin Kierland Resort and Spa has 732 guest rooms, including 55 suites and 32 casita units. All guest rooms are smoke-free and come with a private balcony or terrace. There is also the Westin Kierland Agave Spa. The closest airport is Phoenix Sky Harbor International Airport. The airport is served by Delta, American Airlines, US Air, United, Northwest, and other airlines. The Gold Canyon Golf Resort & Spa at Gold Canyon, Arizona, is located in Arizona's Superstition Mountains. The mountains are imbued with mystery and tales of lost gold mines, such as the Lost Dutchman. Plus, the great Apache war chief, Cochise, is reputedly buried somewhere among these mountains. Two courses designed by Ken Kavanaugh—Dinosaur Mountain and Sidewinder—take golfers deep into the High Sonoran desert where the solitude of the environment verges on the spiritual. Dinosaur Mountain golf course offers an exhilarating round of golf. The course is one spectacular vista of the Superstition Mountains after another, particularly from the course’s signature fourth and fifth holes. Dinosaur Mountain has always been a player's course, but the placement of the tee boxes allows golfers at all levels to enjoy a challenging round. Dinosaur rated the number one public golf course in Arizona, also ranks high among the most scenic courses in the Southwest. Gold Canyon’s second course, Sidewinder, is noted for a creative design that incorporates the desert landscape. Its panoramic vistas are no less spectacular than those of the Dinosaur Mountain course. This is a course you’ll want to play more than once. The Phoenician, a Luxury Collection Resort, in Scottsdale, Arizona, offers luxury accommodations in a setting of beauty and style. Amenities include 27 holes of championship golf, nine swimming pools, and a tennis garden with 11 lighted courts. The City of Scottsdale is famous for its spas, and the Phoenician boasts one of the finest: the Centre for Well-Being. The kids can enjoy themselves at Funicians Kids Club while grownups go to the links or the spa. Finally, there's the upscale food and drink ranging from sandwiches and snacks to the award-winning J&G Steakhouse inspired by renowned chef Jean-Georges Vongerichten. The Phoenician also offers a wide variety of family activities, including leisure and recreation options for adults, teens, and children. The staff can arrange personalized tours through the red rocks of Sedona, day trips to the Grand Canyon, visits to authentic Western ghost towns, hikes through the pine-covered mountains of Flagstaff, and much more. The closest airport is Phoenix Sky Harbor International Airport. The airport is served by Delta, American Airlines, US Air, United, Northwest and several other airlines. Aside from its magnificent golf course, Legacy Golf Resort in Phoenix offers a range of top-class amenities, including a sparkling pool, deluxe health club, and an endless variety of recreational activities. The resort has 328 luxury, Spanish mission-style guest suites housed in 12 buildings. Each suite features rich wood cabinetry, a full kitchen or kitchenette, a spacious living area, and either a balcony or patio overlooking lush tropical courtyards and spectacular mountain views. Legacy Golf Resort is located on what was once Dwight B. Heard's 7,500-acre ranch. The resort designers have integrated some of the Heard heritage and Arizona's history in the structures and monuments, giving the 18-hole championship golf course a signature look. At JW Marriott Camelback Inn Resort & Spa in Scottsdale, Arizona," as with all J.W. Marriott Resorts, nothing is done on a small scale. For golfers, the main attraction is the resort's 36-holes of championship Arizona golf. A spa, a lavish meeting space for conferences and events, and hotel casitas with traditional Southwestern decor are spread throughout the resort's desert landscape. All the casitas have balconies or patios, and the resort boasts an extensive pool complex ideal for family vacations. This getaway is located minutes from downtown Phoenix. Boulders Resort & Spa in Scottsdale features two championships, Jay Morrish courses, both designed to make the most of the sweeping panoramic views and to have as little impact as possible on the delicate Sonoran ecosystem. Both courses stretch across a sunny Sonoran Desert landscape. These two grand golf courses make the Boulders Resort & Spa one of Arizona's premier golf resorts. The Boulders Resort is one of those places where the spectacular scenery is just as much a part of the experience as the opulence of the resort itself. Colossal rock formations and boulders, from which the resort takes its name, are the residue of a cataclysmic geological upheaval more than 12 million years ago that ultimately led to the creation of the Grand Canyon. The Boulders is wild country, unspoiled, quiet, and seemingly as far away from it all as one can get. In actuality, it's just 15 minutes from Scottsdale. It’s a land where tiny critters have to watch for dangerous predators like snakes and raptors; they eke out an existence among the rocks, brush, and giant saguaros. Searching for a wayward drive here is an adventure. The rugged terrain, tight fairways, and the natural hazards that lie just beyond them make for a real golfing challenge, but one that’s more positive than punishing. The breathtaking scenery more than makes up for the odd lost ball. The Sheraton Grand at Wild Horse Pass golf resort in Chandler, Arizona, pulls from Native American influences in the Valley of the Sun. The architecture, design, art, and legends of the Pima and Maricopa tribes are a major feature of this gorgeous resort. Accommodations include 500 culturally themed guestrooms, a spectacular full-service spa called Aji, a riverside swimming pool and waterslide, jogging trails alongside the re-created two-mile Gila River, and the Wild Horse Pass Casino just a short boat or shuttle ride away. The Whirlwind Golf Club with two championship 18-hole Troon-managed golf courses makes this a special destination for a golf getaway. The club's Chandler courses are masterpieces developed by Gary Panks that are home to the PGA's Nationwide Insurance Tour and the Gila River Golf Classic held every year in October. Chandler's Cattail and Devil’s Claw courses sprawl over 242 acres of rolling terrain, with 92 acres of turfed area and 150 acres of a desert landscape featuring mesquite, cottonwood, and paloverde trees with native saguaros and grasses. Panks' design is considered challenging but fair for players of various handicaps. Ocotillo Golf Club is a Phil Mickelson golf property in Chandler, Arizona. This premier golf destination offers a country club experience at one of the nation's finest daily-fee facilities. 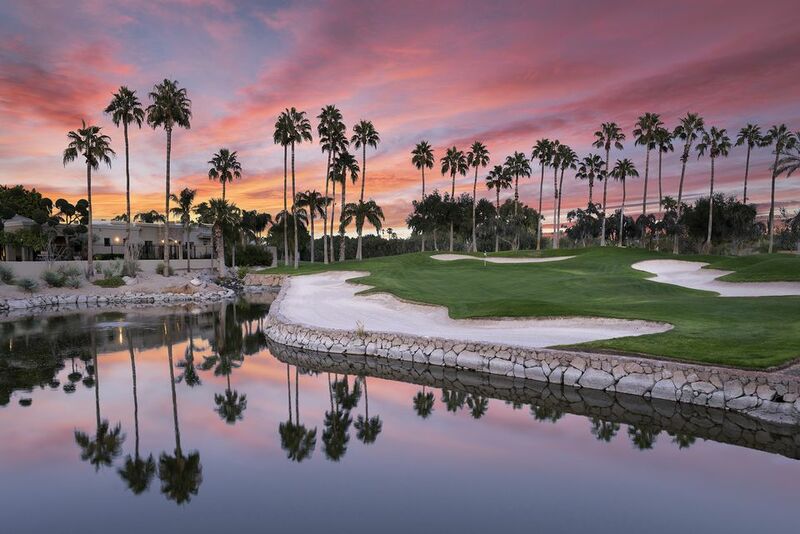 The challenging 27-hole Ted Robinson design is a dream layout of rich greens and deep blues, with cascading waterfalls, palm trees, gently rolling fairways and colorful flowerbeds. Even beginners, who can take golf lessons on the property, will love this club. Ocotillo is located minutes from most of the Valley of the Sun's prominent resorts and hotels via the 101 Price Freeway. If you've never played a Jack Nicklaus Jr. layout, you'll want to try the Golf Club of Estrella in Goodyear, Arizona. Located in the planned community of Estrella Mountain Ranch in the West Valley, the club is "one of the top 20 best courses you can play in Arizona," according to Golfweek magazine. It offers one of the area's most challenging golf experiences amid fine panoramic views from rolling fairways that follow the natural contours of the land. Elevated tees provide unparalleled views of the Sierra Estrella Mountains. The club is an upscale, daily-fee operation with a traditional clubhouse and a special experience for golfers of all abilities. Find a Phoenix Film Festival!